The first Kinsella Christmas card. 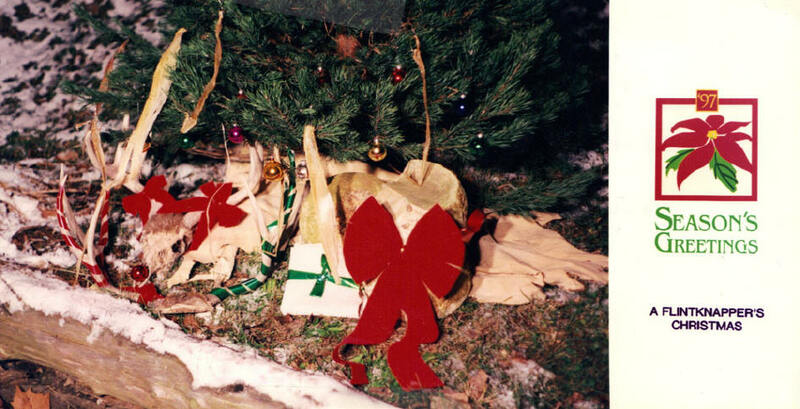 Dave Klostermeier saw Larry's deer hides hanging in the trees (to keep the dogs from ruining them) and thought he should hang Santa there too. That was the start of the Kinsella Christmas Cards. 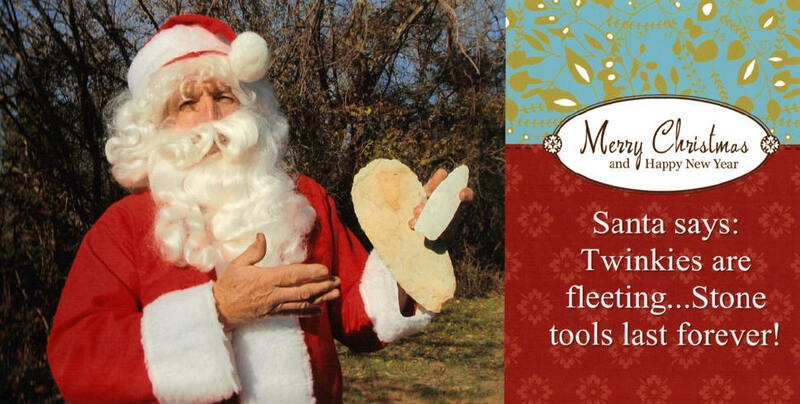 Larry usually tries to include primitive technologies, and/or archaeology, and humor, with a Christmas theme. Sometimes, it works, aaaand sometimes, it doesn't. In 2007, a friend told Larry he was "the Gary Larson of Archaeology". "Here Rudolph! Come on. boy"
"Atlatl, what the hell is an atlatl?" "Santa got caught skinning Barney"
"If at first, you don't succeed..."
"Hunter/gatherer Santa vs Agriculturist Santa"
"Santa wins the Darwin Award"
"Santa joins the Department of Homeland Security"
"Santa says, This spud's for you"
"Santa wishes you, a Merry Axemas"
"Santa discovers weapons of mass destruction"
"Santa finds the original Axes of Evil"
"Santa jealously guards his Retirement Fund"
"No, you may not have an atlatl and dart for Christmas, You'll shoot your eye out. Trust me!" 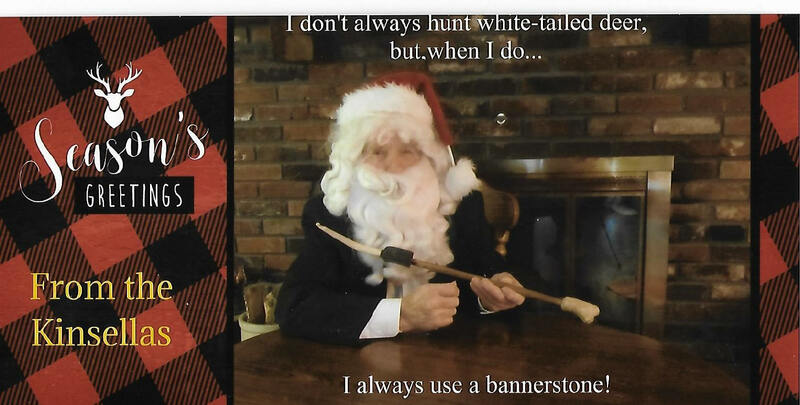 Santa says, "Don't Touch my Junk"
"Santa just KNEW there had to be a KN-APP FOR THAT"
Santa Says "Twinkies are Fleeting...Stone tools Last Forever"
"MERRY CHRISTMAS, I made it myself"
"Santa's Prepared for the Zombie Apocalypse"
"Santa plays his Weapons of Mass Percussion! 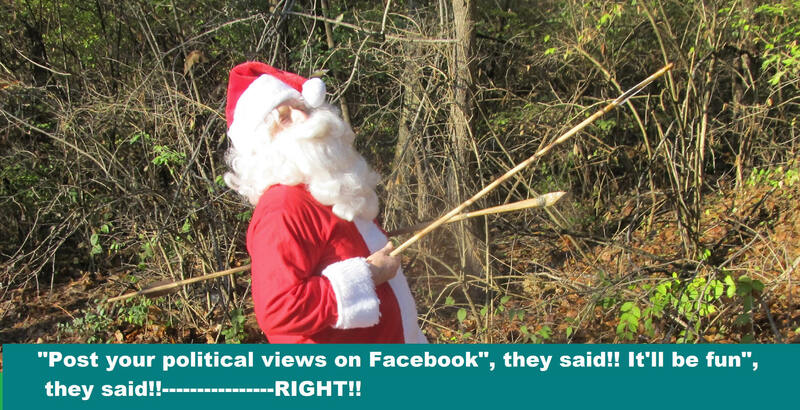 "Clowns to the left of me, Jokers to the right...."
"I don't always hunt white-tailed deer but, when I do, I always use a bannerstone"
"Post your political views on Faqcebook", they said!! "It'll bre fun" they said!!-----------RIGHT! !